I saw Great Northern two years ago, I hadn't heard of them at the time, but was impressed with their dreamy vocals over shoegazy melodies. I even went so far as to produce this drawing of them. 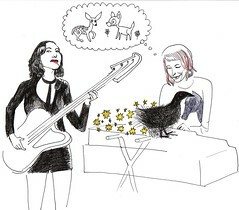 The drawing capture (now former) bassist Ashley Dzerigian and singer Rachel Stolte talking about deers and their love of nature (note: horse shirt and crow on the keyboard). So, I get the impression that this Los Angeles-indie band's creative team consists of singer/keyboardist Stolte and former 30 Seconds to Mar guitarist Solon Bixler (incidentally he's from my hometown in Fresno!). They had signed to Eenie Meenie Records, releasing Trading Twilight For Daylight in 2007. You may have heard some of the songs in last year's Nissan Murano commercial ("Home") or watching the television show Bones ("Low is a Height"). Great Northern is back with their second album, Remind Me Where the Light Is, released two months ago. They are currently just wrapped up their tour with The Dears and Eulogies and now starting with some dates with She Wants Revenge, before venturing to the UK in July. One of the thing about Great Northern's music and theme is that they haven't change much, and that's comforting. One thing I've noticed about Remind Me Where the Light Is right away is that all their song titles are simple one-word descriptions. With the exception of the two-worded title "New Tricks", which actually serves as a nice break in the middle of the album. Some key songs worth noting: "Story", "Houses" (love it when the line "All this time when I talk its not real, its not real" kicks in), "Snakes", "Fingers", "Numbers", all nice, fuzzy feeling with that melodic Stolte voice. Fans of Solon's singing should look to "Driveway". I really like the song "Fingers", but I can't quite make up my mind of what is being sung. At first I thought Stolte was singing, "kill me now with your fingers". Then I thought, it's "come out with your fingers", which doesn't make much sense either. Remind Me Where The Light Is is out now on various formats from Eenie Meenie Records. And although it's nearing the end of their US tour, it's not too late to email pictures of Great Northern live to contest(a)eeniemeenie.com to win the new album on 180 gram vinyl, a limited edition 7" featuring an unreleased track, and a canvas tote bag. That's three winners per week! The press release for Soul Merchants classifies their sound as "psychedelic goth rock". Seeing as how I'd never heard that sort of description before, I was curious to find out what they sounded like. After my initial listen, the closest bands out today that I could compare them to would be Interpol and She Wants Revenge. To be fair, I could compare them to the likes of Joy Division in tone. Soul Merchants were only around from 1985-1987, but they made 100+ recordings and one LP. Based out of Denver, Soul Merchants gained a small and devoted fan-base, and they played their last show at the inaugural SXSW This dual disc collection titled 1985-1987 has over 160 minutes of music spread over two disks. These are only just their cassette releases, that have been remixed and remastered by former Merchant Bob Ferbrache. The CD I was sent only had 15 songs out of the 40, but it was more than enough for me to pick out a favorites. "Beating Heart" was a favorite because of the awesome drum intro, and the guitar riffs in the background remind me of a 60's psychedelic acid trip, while "Love" reminds me of T-Rex on a downer. "Johanna" was a favorite with everyone who listened to it, and that got the most comparisons to Joy Division. I myself just liked the way that just when I thought it was repetitive, there was some sort of musical surprise. In any case, I'd really like to hear their LP Gates of Heaven. There's talk about that being reissued. Wow! The Cruxshadow are the hottest dance group! They have legion of fans, who made their single "Birthday", the number one US Dance single for the week of Sep 22 2007 on Billboard. Not only that, but last year's single "Sophia" climbed the Billboard charts to #3 the same week that "Birthday" debut. "Sophia" also debut at #1 in 2006, displacing Beyoncé. Both singles are from their 2007 album DreamCypher. The band have been around since 1992, forming in Tallahassee, Florida. Originally with Rogue, Sean Flanagan and Tim Curry (I don't think it's that Rock Horror guy), the band's line up changed in 1997 when both Flanagan and Curry left the band. The band is known for their long tour (averages about 100+ shows a year), but it seems in 2008 they are only sticking to major music festivals in Europe, where they are enjoying massive success. I have to admit, I really love "Birthday". What is it about that Darkwave/80s Sound that I love so much? Is it the synthesizers? The moody vocals? I can't put my fingers on it, I just know I really like this sound. Even the two other mixes (a radio edit and a club mix) are also good, considering that I'm not a fan of remixes. The radio edit is understandable since it cuts the song off by a full minute. It's not a simple edit, because the radio song has fewer beats and brings up the vocals more clearly. The "Through the Looking Glass Club Mix" stretches out the song and put even more synth and making it kind of like a dance house song. Also on the EP is the only new song: "The 8th Square". The best part of this sing is the electric violin and the very catchy line that ends at each song verse: "And I will strive with all my power/To reach the 8th and final square". The other song, "White Rabbit", is a Jefferson Airplane song. I haven't actually heard the original song, but this is a pretty strange song about Alice in Wonderland. DreamCypher was released earlier this year (Jan 16th) and their smash single Birthday was released Sept 4th, on Dancing Ferret Discs. PS, working with other W♥M people to submit their videos, so this may be the last vu-solo video effort. I uploaded the original "White Rabbit" by Jefferson Airplane, and the remake by The Cruxshadows in case anyone wants to compare them. The remake of "White Rabbit" reminds me of a cover of Tori Amos' "Bliss" by Glampire for some strange reason.